Pastor Morris has been serving the Lord since he was 11yrs old. He is a man full of the Holy Ghost and honored and respected by his church and community. Pastor Morris loves people and loves God. God has given him a heart of compassion and servanthood for God's people. 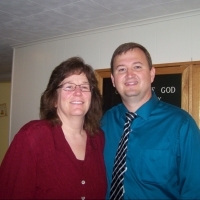 Pastor Morris has been married since 1992 to Jayne and they have three wonderful children David, Josh, and Rachel. Pastor Morris worked in the church for many years as Youth Leader, Deacon, Teacher, and many other positions. God put a call on his life at a young age. Pastor Morris spent several years filling in for pastors for vacation and as interm pastor from time to time. Pastor Morris has been pastoring here since 2005. God is truly doing a great work thru him and in him.